Koala Kids Foundation is a volunteer driven organisation that provides the small things that make a big difference to the lives of children and young people in cancer treatment and their families in Victoria. For 10 years they have been providing educational and entertaining activities and quality consumables to distract, comfort and engage young patients from the pain associated with the pediatric cancer journey. This June, 10% of proceeds from our Fun, Bright Bouquets will go to assisting Koala Kids . 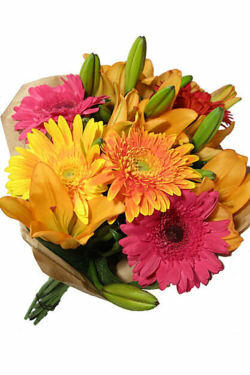 Send this happy mix of gerberas and lilies to someone and pass on some of that happiness to the kids benefited by Koala Kids programs. Koala Kids is active in the Children's Cancer Centres at The Royal Children's Hospital and Monash Children's Hospital and the Pediatric Radiotherapy Service and Adolescent and Young Adult Service at Peter MacCallum Cancer Centre. They work hard to ensure they don't duplicate the work of other charities and have minimal operational costs, working from donated office and warehouse spaces. They source all of our consumables and programs as donations, at cost or heavily discounted.